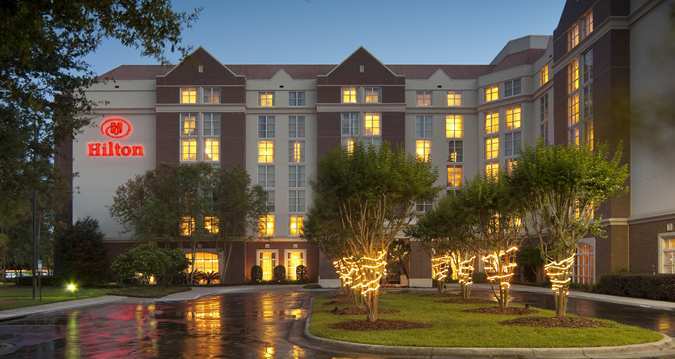 We combine Hilton hospitality with the convenience of an IACC Conference Center on the UF campus at Hilton University of Florida Conference Center Gainesville. Business is easy at our Gainesville hotel which offers meeting space and complimentary WiFi access throughout the common areas. Hilton University of Florida Conference Center Gainesville, a convenient choice among hotels in Gainesville, Florida, is situated directly on the University of Florida campus with easy access to Gainesville attractions, including Butterfly Rainforest and the Florida Museum of Natural History. Enjoy the outdoor swimming pool and relax in the whirlpool. Stay fit in the fully equipped 24-hour fitness center featuring Precor equipment. Watch sports games on the flat-screen TVs in 2-Bits lounge, named after Mr. 2-Bits, a famous Florida Gator cheerleader. Within walking distance of Ben Hill Griffin Stadium at Florida Field, better known as The Swamp, this hotel is the perfect accommodation for attending a Florida Gator game at UF. Hilton University of Florida Conference Center Gainesville is also close to the University of Florida golf course, performing arts center, shops, restaurants and more. Hold your next conference, wedding reception, or event in more than 25,000 sq. ft. of meeting space at our Hilton hotel in Gainesville, FL. Relax in one of our spacious rooms after a day of Gator football.